YEREVAN (Noyan Tapan)–"Relieving tension–establishing peace and stability–developing political and economic relations with neighboring countries are the main directions of the official Tehran’s foreign policy," Iranian Charge d’Affaires to Armenia Hekmatollah Ghorbani told a news conference March 24. Addressing the development of the Armenian-Iranian relations–Ghorbani pointed out that the level of diplomatic relations will be raised. The newly appointed Iranian Ambassador to Armenia–Mohammad Farhad Koleyni will arrive in Yerevan within a month. In addition–high-level mutual visits are expected–whereby "we will register positive developmen’s in our relations with Armenia." As to the development of economic relations–Ghorbani pointed out that these relations have been following their natural course for several years. Commenting on the statement made by Advisor for the US Department of Commerce Jan Kalicki that the US will object to any oil or gas transit though Iranian territory–including the Iran-Armenia gas-main–Ghorbani said: "It is not quite understandable why foreign diplomats should determine the destiny of other independent states. It runs contrary to diplomatic norms." Special attention was paid to the annual national religious festival "Novruz" celebrated for 13 days beginning March 21. Ghobani pointed out that "in the Novruz-to-Novruz period" it is accepted to make assessmen’s of the most important political–economic and social events. 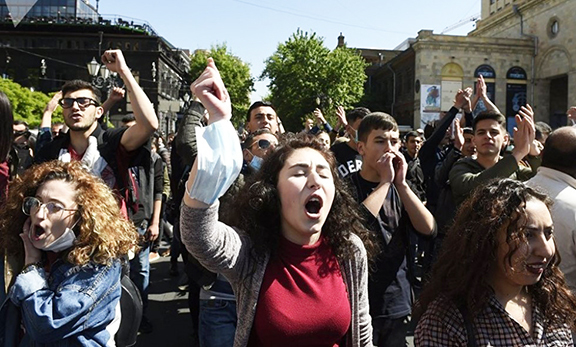 Ghorbani singled out the local and parliamentary elections (in which 70% of the population participated) as the most important political events in Armenia last year. According to the Iranian diplomat–last year saw progress in the development of the relations between Iran and European countries. As to the US attitude towards Iran–Head of the Press Department–Iranian Embassy–Ali Kazim-zade described it as a two-faced policy. On the one hand the US is bringing a number of accusations against Iran–including an accusation of terrorism–stating that the official Tehran hinders the peace process in the Middle East. On the other hand–the US suggests establishing a dialogue between the two countries. "Indeed–the US tone towards Iran has softened over the last year. But we have no proofs that the opposite side is willing to resort to any steps. There are not yet any common grounds for a dialogue," Kazim-zade said. As to the Armenian-Israeli contacts and Iran’s attitude towards them–Kazim-zade pointed out that it is a matter of Armenia’s and Israel’s concern. He expressed the opinion that despite the campaign carried out in this aspect "the Armenian-Israeli relations are not serious–nor is there any serious coincidence of interests." At the news conference–reporters received information of Armenian Prime Minister Aram Sargsyan’s planned visit to Tehran–and of the third meeting of the Bilateral Economic Cooperation Commission to be held in the near future.